MaltaToday for Air Malta: Sale will be available for eight days up to Sunday 6 October at 11:59pm Malta time. Air Malta has just launched a campaign offering a 25% discount on over one million seats on its scheduled network in and out of Malta. 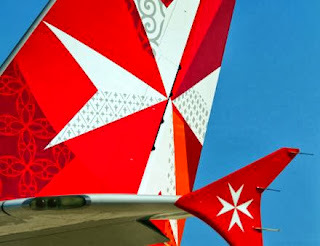 Philip Saunders, Air Malta's Chief Commercial Officer said: "This is a great opportunity for both locals and visitors to grab a bargain flight from Air Malta with the opportunity to choose dates over a nine month period right up until the end of June 2014. We are offering a 25% discount to 23 destinations on 1.17 million seats. We're sure that the offer will be a great success but you'll need to hurry to book as the offer ends at 11.59pm on Sunday 6th October and we don't want anyone to miss out!" Last winter 680,000 passengers travelled on Air Malta flights, an increase of 40,000 over the previous year. "We hope that through this offer we will register similar increases and continue being the major contributor to the record number of visitors to the Maltese Islands," Saunders said. The sale, which has opened today, will be available for eight days up to Sunday 6th October at 11:59pm Malta time. Tickets purchased through this offer are valid for...read on.